Editor�s Note: Finally, after interviewing many deserving male boarders, we�ve prevailed upon Christine Cameron to "interview herself." It is our honor to present her as August�s Boarder of the Month. Congratulations, Chris! My name is Christine Cameron. 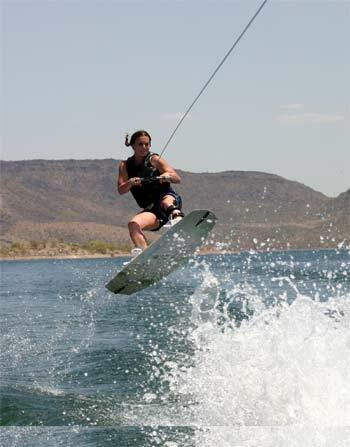 I am 35 years old and I live in Mesa, Ariz.
I�ve been wakeboarding for about six years. How did you get into wakeboarding? One of my co-workers bought a 2000 X-Star. I loved going to the lake, but he wouldn�t let me just sit on the boat and hang out. So, they taught me how to wakeboard that year. What was the first trick that you learned? The first trick that I learned was a Stiffy, which is when you bring the board out in front of you when you jump the wake. The people on the boat end up seeing the bottom of your board. What is your favorite trick to see being done and why? My favorite trick to see being done is a huge Raley. From what I�ve been told, it�s not the hardest trick to learn, but it dishes out some spectacular and painful crashes. What is your favorite aspect of wakeboarding? My favorite aspect of wakeboarding is being at the lake with friends. You help run the AWA. How did that come about? When I started competing, I always volunteered to help out. I was dock help and then worked registration. When Tom Bugg (AWA Founder) announced that he was leaving, Mike Haley and I couldn�t stand the thought of the association�s dying. So, we took it over almost two years ago and haven�t looked back since. What do you like most about the AWA? I like the people who are involved. We have an awesome group of people involved in the organization. Not only are the riders incredible on the water, but also they are like family. What is your most memorable experience in wakeboarding? My most memorable experience would have to be my trip to WWA Worlds in Orlando, Fla., in 2004. It was a comedy of errors. The airline did something and broke the aluminum fin off my board. I was late getting to the site, thanks to early morning Sea World traffic and almost missed my run. Top that off with the fact that I hadn�t ridden in four weeks, because I had had nasal surgery. I was a complete disaster! Remarkably, I stood up my run, which was the first time that I had done it successfully (EVER). I ended up placing fifth in my division. I would like to thank all the riders and sponsors of the AWA, Heidi and Woody at physiotherapy in Tempe for bringing me back from my numerous injuries, and Glen for being patient and teaching me almost everything I know.